APD sources from Accra has just reported some disturbing news. Seems NPP wants to steal this election by hook or crook. 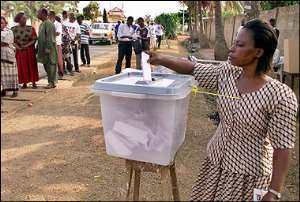 Unimpeachable sources inform our correspondents that right now the police in Kwamikrom (Volta Region) where the Volta Regional Minister is running for parliament were called to a scene where the Minister's area boys were thumb printing hundreds of ballot papers for the NPP. The NDC intelligence agents in the area heard this and reported to the police. When they swooped on the resident these area boys in Kwami krom were caught in the act. 2. The customs officers at the Togolese boarder arrested people carrying a casket (pretending to be the human remains of a beloved family. The casket was full of ballot papers thumb printed for Kuffour. 3. The butcher of Lome Gnnasingbe Eyadema is in Ghana right now. The question is "doing what?" It was earlier reported that he was to send his son to Ghana to bring already thumb printed ballot papers. His evil son was slapped by somebody and he has now been paralyzed. Information reaching me from Aflao indicate that that slap was laden with African electronic venom and the venom did its job. People with relatives in Togo know how Eyadema junior is the epitome of evil and terror. His paralysis, if true will be welcome news to many Togolese nationals who had to endure countless years of ignominy, torture, and human degradation under this weasel, creep and epitome of human debris.